Due to the subject matter this film is a hard sell for me – it’s just not my type. 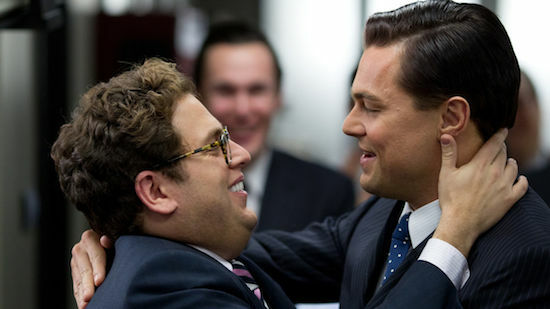 That said, Leo and Jonah are both fantastic actors who put on some of the best performances of their careers. However, when watching the film, it felt like osmething better described as a modern Tarantino-esque spinoff of The Great Gatsby. Although, that may be due to residual bits of Leo’s performance in the Luhrmann adaptation earlier this year. There are definitely genuine laughs, but a lot of the humor is so coarse that it borders on The Hangover-level scenarios that are just hard for me to get excited about (read: midget dartboard). The best moments are when the actors have a chance to open up: the pen scene at the diner, for example. Technically, this film is a mess and the editing is pretty awful (probably due to the extremely rushed release schedule – it feels like a solid rough cut, especially toward the beginning). Prieto doesn’t bring much to the table, lighting or composition-wise, and the music never quite fits the way it could for this kind of film. As a whole package, it just doesn’t deliver the way I’d expected from a Hollywood legend. Be sure to follow me on Letterboxd to keep up with my reviews and opinions on films!